Jeff and I are always looking for ways to combine both the sterling silver and the glass cabochons. Then one day we had invited friends over to show them the things we had made with the silver and the glass cabochons. 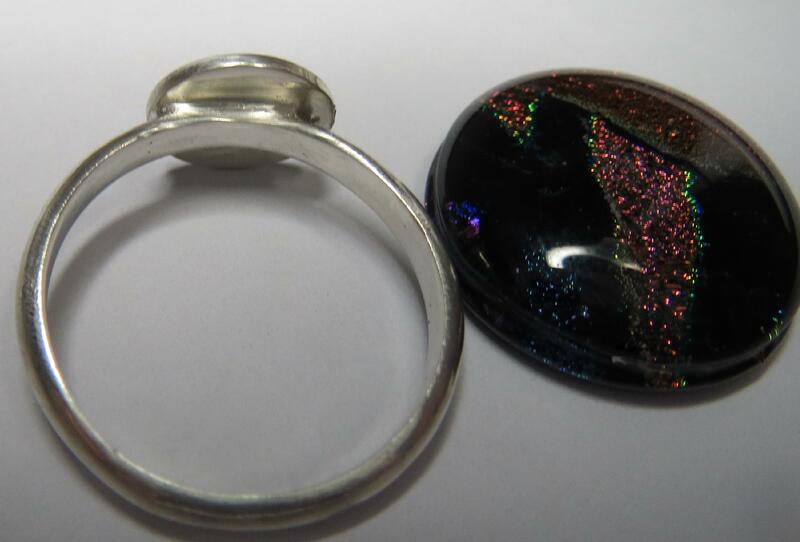 Our friend Karen suggested making large cabochon rings. We laughed, as Jeff had suggested it a little while ago but I wasn’t sure, thinking that the cabochons would be too big or so I thought. She said, she would wear them and she knows others that would too. Well , Jeff and I talked about it and decided to give it a go. So I ordered some 10mm round sterling silver stamping shapes and sterling silver wire. The thought was if I soldered the round sterling silver disk shape onto a ring we could then glue a cabochon on to it. The glue used today is so good that we had no fear of it separating from the ring. The only thing I didn’t realise was how hard it would be to solder the disk onto the ring. Once the 10mm round sterling silver stamping shapes arrived I got too and made a band out of 2 mm x 1.5 mm half round wire. I used medium grade solder wire, as I knew that I would have to do more soldering when adding the round shape to the ring. The medium grade solder would hold up better when I reheated the band to attach the shape. The next step was to add the round shape to the ring. First of all I needed to make a rough flat surface on both the band and the sterling silver round shape. To do this I used a fine file making sure to only roughened up a small area where the two surfaces touch. When that was all done it was time to solder. Using my soldering block I put the round shape down with the roughened side up and then placed the band on top. Holding the band onto the shape proved to be a problem. I used tweezers but I had trouble keeping the whole thing in place. Once I thought I had them touching I soldered the two together with medium solder wire. It looked fine , I was really happy that it seemed to have worked. Then I decided to just check the shape was attached. When I pulled on the shape it came apart, it was very disappointing. Well back to the drawing board, as they say. So I started again. Holding the band I reheated the solder that was still on the join and added some easy solder paste. The solder ran well, but this time I made sure I gave it a little more heat. I then quenched it with water. It was soldered this time but then I discovered that it was not soldered in the right place, it wasn’t centred. Oh well, I will put this down to experience. In Part 2 I will talk about one solution I came up with. What a well described post. ty! Thank you for your comment it is very encouraging.